Satchels have come back in a big way recently. As The ultimate cool girl accessory in the summer due to it's easy breezy carefree feel. I think it's also one of the key trends that can cross over into winter. No longer reserved for nerds and school girls they have become the status symbol of the fash pack and everyone is wearing them. Practical and super cute every winter wardrobe should have one of the off the shoulder carry alls. It's the most functional bag you will ever use. Roomy, structured and timeless they are spacious enough to carry around everything you could possibly need. My favourite satchel style bag at the moment is this triple toned one from New Look. Featuring black, grey and oxblood style panels to create a sleek chic on trend look. Oxblood is definitely the colour of A/W 2014 and in a really cool textured croc style print it's one not to be missed out on. Featuring both a long strap and a top handle for multi functionality, This bag is sure to keep you organised and sophisticated this winter. Yessss, you can never go wrong with a satchel!! this bag is gorgeous, satchels are the perfect bag! That bag is too fab! Very elegant, I want to be a business woman just to be able to carry a satchel like that. Oxblood is heaven. That satchel is gorgeous! I love the colour combination of red, black and gold. And the texture of the crocodrile print makes it look like it was from a high end brand! This bag is looking super adorable ! In love with that satchel! New Look definitely seem to have upped their game recently! I bought this bag last week, and am already getting so much use out of it. It's such a Tardis bag - I managed to get a whole change of clothes in there a couple of days ago! The colours are perfect for Autumn! This satchel is beautiful - so metropolitan! I love this, especially the deeper red panel! It's such a beautiful bag. I love the colors! Love the two colours in this - a perfect Autumn piece! I saw this in your video and instantly fell in love! It's so cute! Love this, Three toned bags are so popular at the minute! Love that bag and love your blog! I spotted this satchel in New Look today, i love everything oxblood at the moment too! I've never went off the satchel since they first came back around - I think it's the best bag style! Love the different shades of this bag! i decided to get a new college bag and my eyes would normally skip over this sort of style (i like holographic, metallics and silvers) but i'd seen this blog post so i did actually check it out !! 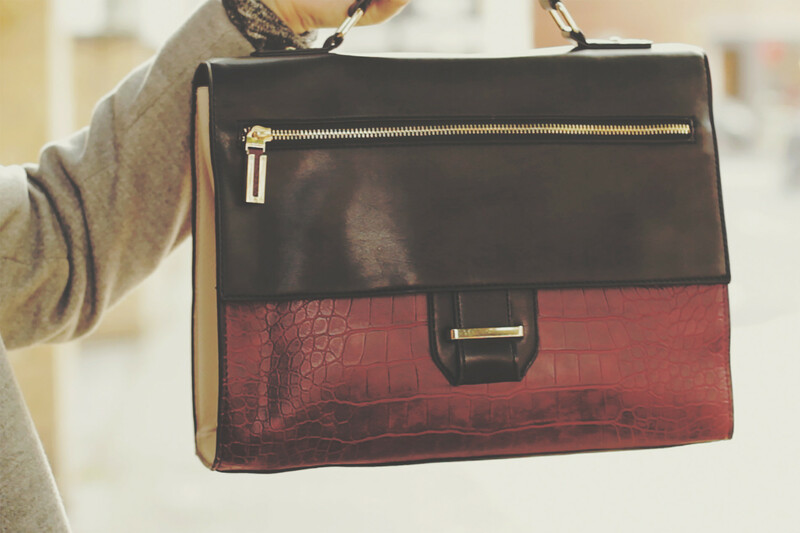 i'm normally a backpack kind of girl, but i love the size of this bag, it's really smart and the oxblood crocodile print is so different !! for £25 it was a real steal; it looks like it should cost so much more. 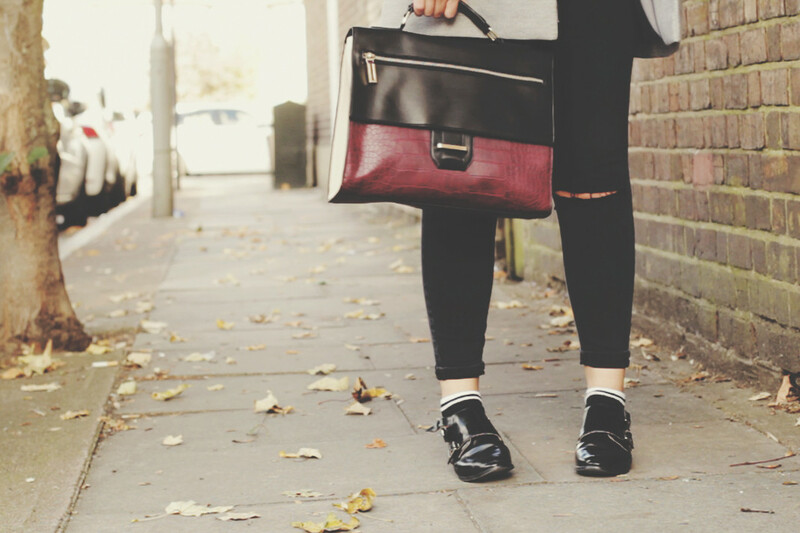 thanks for featuring it, i think i've found my favourite aw14 bag, i love it !! I love the look of satchels. However, the only thing I don't like about it is the whole cross body thing or only one shoulder - it makes me feel like I'm giving myself an imbalance in my shoulders. This satchel looks wonderful though! Especially love that front zipper!! love this satchel :O !